Hands up if you've ever been scoffed at by a family member / friend / person on the street / random jellyfish when you tell them that you study the arts, humanities, or social sciences. "What on earth are you going to do with a degree in THAT? ", they laugh. Your friends studying chemistry or maths will be much more successful in the job market, or so they tell you. Conversations such as this can leave you feeling really downbeat and frustrated. To help you out, I've come up with an extensive list of how you can counteract these dismissive and condescending arguments and stick up for yourself and the degree that you love. Ready? Let's kick some arse. 💥 "There's no value to studying the humanities!" In fact, the humanities teach us many valuable lessons for today's society. Humanities subjects teach us to challenge definitions, make new connections, and break boundaries. 💥 "Humanities degrees are easy, there's no skill involved"
In many ways, humanities subjects are more challenging to excel in than the sciences. There is often no "right answer" to a question in a history exam, one can only argue well. Therefore, there is a HUGE amount of skill in humanities subjects, you don't just have to remember your case studies, historical narrative, or facts and figures, you have to deploy them skillfully and construct well-written, reasoned arguments. Yes, it is a different type of skill to those that scientists acquire, but it is a skill nonetheless, and a valuable skill at that. Humanities degrees also endow their students with an array of transferrable skills that are relevant to all kinds of future careers. Creativity gained from an art degree will be invaluable for a career in PR or digital marketing, for example. Critical thinking learned from a history degree can aid a budding politician or consultant. Written communication learned from a degree in English is helpful in pretty much any job going! Arts students - your skills are REAL and IMPORTANT. 💥 "The humanities are irrelevant"
Oh really? Research by the UCL Center for Digital Humanities shows that 55% of people read works of fiction, such as novels, plays, and short stories, and that 76% of people believe their lives to be enriched by visiting sites of historical interest, art galleries, and other cultural attractions. Academic Sarah Churchwell brilliantly sums up the importance and vitality of the study of the humanities in a Times Higher Education article from 2014 (which I strongly encourage you to read in full): "The humanities teach us not only what art is for, but what life might be for, what this strange existence might mean. What kind of humans would think that the humanities don’t matter? We need the advanced study of humanities so that we might, some day, become advanced humans." 💥 "A humanities degree won't get you to the top of your career ladder"
WRONG. Here's a list of just a few people who have made it big off the back of a humanities degree. Andrea Jung, CEO of billion-pound corporation Avon, has a degree in English Literature. Anne Sweeney, former co-chair of the Disney corporation and no.9 on Forbes' list of most influential women in business, has a Bachelor of Arts degree. Susan Wojcicki, the current CEO of YouTube, has a degree in History and Literature. Judy McGrath, CEO of MTV, has an English degree. Current UK Prime Minister, Theresa May, has a degree in the Geography. Amber Rudd, the UK Secretary of State for Home Affairs, has a History degree. But don't forget the most powerful argument of all for studying an arts degree. If this is a subject that you love, feel passion for, and couldn't imagine yourself doing anything else, that is good enough. 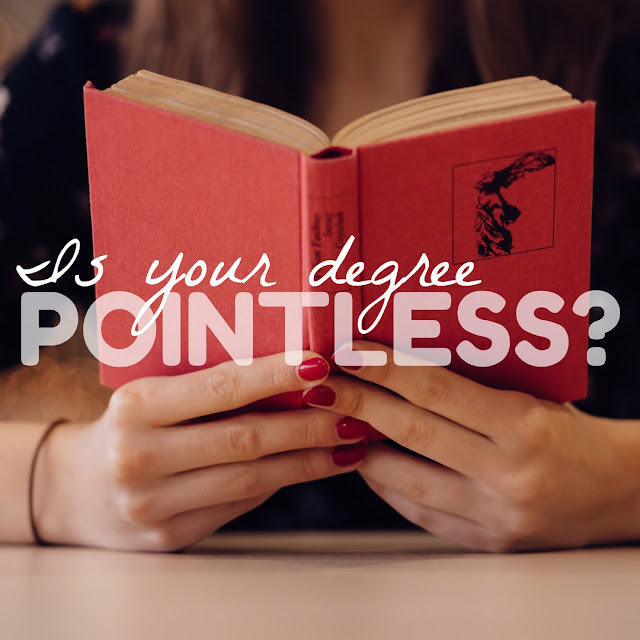 You have a right to be educated in a field that you adore, be that in the humanities, sciences, or baking technology management (yes, that's a real degree). You go out there, work hard and get the degree that you deserve! You're worth it. What are your thoughts on studying the humanities? Please discuss with me in the comments below!